Simply put, marketing is the journey from product decision to sale. It’s more than the idea of a sale or promoted item, more than a giveaway or campaign, and definitely more than than the “50% Everything!” poster in your window. Marketing is an expression of your business to those who interact with it. So Marketing isn’t Just Advertising and Sales? No! Advertising and sales are, of course, a part of your marketing, but it’s so much more! Capture attention – We live in a fast paced world. Every day consumers are exposed to hundreds or (depending on which study you read) thousands of ads. How do you make yours stand out from the crowd, especially when everyone else is trying to do the exact same thing?! Flashy graphics, videos, ads in interesting places, and the ever loved marketing term “FREE”, are all easy ways to make your ads stand out from the clutter. Your ad doesn’t have to capture the eyes of every person who sees it, but to the consumer in your target market, it needs to stand out. Facilitate purchasing decision – If you want customers to act on your marketing, you need to let them know why they should buy what you’re selling. Nothing is a bigger turn-off in marketing to a customer than being sold something that seemingly provides no value to their lives. What can your product do specifically to help your customer. If your landscaping services use all natural herbicides, let the consumers know! If your restaraunt has the best prices, quickest service, or freshest ingredients, then by telling your potential customers, you are facilitating that purchasing decision by providing value upfront. Provide an action – Think about the last ad you clicked on. Did it take you to a landing page with a product to buy? Probably. If you were to click an ad for “40% Off Designer Shoes!” and the web page you landed on didn’t have any shoes you could buy, you would be pretty upset, or at the very least confused, wouldn’t you? Well so would your customers! When a customer takes the plunge into your marketing funnel and becomes a true lead, you want them to convert ASAP, so make it as easy as possible for them to do so. If the conversion is online, send them directly to the product or deal you’re advertising. If the conversion is offline, make sure you have enough of the product in stock, or availability for your services, and that you provide a great customer service experience. Make sure that a customer has something to act upon as soon as they are ready to do so. If it sounds like common sense, that’s because it is! Product – This looks different for different companies. A new company will have to come up with an idea of what product or service to sell, determine if everything can be done in-house or if there needs to be distributor relations or contracted parties, and make final decisions early. A company with some years under its belt needs to determine which of their existing products or services they want to market, or decide if they want to break into a new area. This step usually includes focus group testing to determine market appeal and find target markets. All sorts of decisions from sizing, colors, names, flavors, scents, and more happen here. Price – Once a product is chosen, you need to make sure you can make money! Pricing needs to be considered fair by the consumer, and have high enough margins to warrant production and/or resale, storage, shipping, and any other individual expenses your company may acrue when moving products or providing services. Promotion – This is the category that everyone recognizes as “Marketing”. Banners? Check. Brochures? Check. Targeted ads? Check! Every piece of print, every online ad, every bilboard, and every tv/radio/youtube commercial goes right here. Your promotions are designed to generate leads and sales, giving someone at your company an opportunity to close and facilitate that all powerful exchange of goods and services for money. Where is my product stored? How do I get my product from storage to my customer? Answers for these “place” questions are found throughout the marketing process, and processes should be in place early on. At the same time you should be flexible with product placement and distribution, as there are often large cost differentials between certain methods of moving and storing product. Never understimate the power of changing distributors, shipping agents, and manufacturers! “Marketing” is a very flexible term that can be used to describe a myriad of different aspects of your business. It can be online ads, in-store flyers, B2B and B2C sales, or even a Facebook comment! 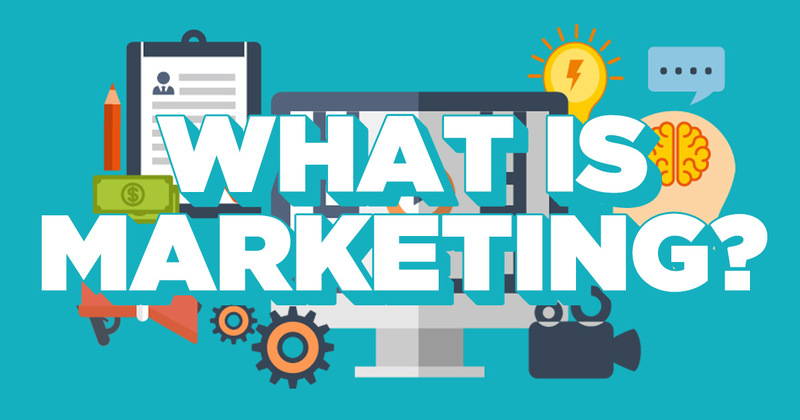 Marketing begins in the merchandising and the creation or aquisition of a product or service, then moves through core audience identifications into promotion, and finally leads to sales. Questions? Comments? Concerns? We’re here to help! The reason we can put out content like this is, well, because WE are marketers! (Crazy right?) We’ve been in this game for a while and we know what it takes to market your business, because we have done this for ourselves as well as our clients over the years. The next time you need marketing done right, give us a shout. You’ll be glad you did!